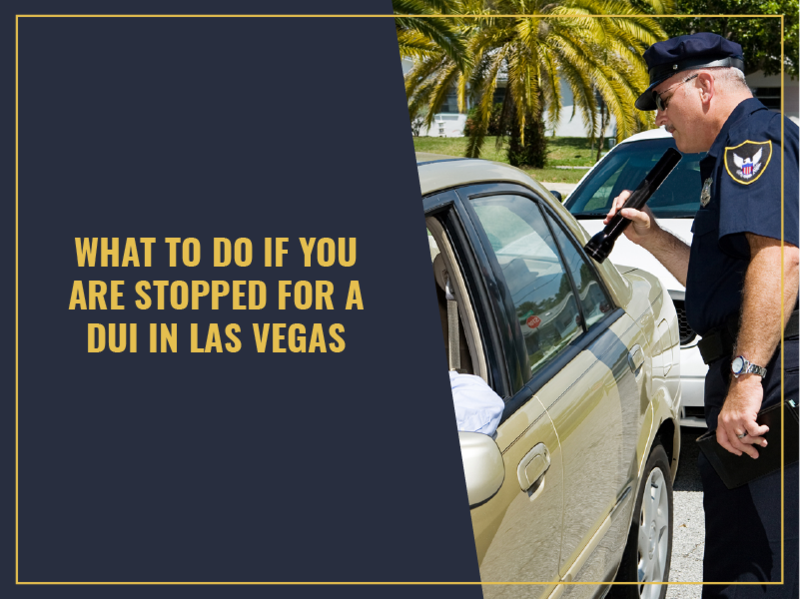 What to Do If You’re Stopped for a DUI in Las Vegas - CEGA CRIMINAL LAW, Inc. Imagine this scenario: You’re out for drinks and dinner with friends. You have a few rounds too many, but you think you can drive home. You’re about a mile away from your house when you see flashing lights in your rear-view mirror. Your heart sinks into your stomach. You guessed it: You’re getting pulled over. Thoughts race through your mind. Will you need a DUI lawyer? Are you going to jail? If you’re pulled over on suspicion of a DUI, you don’t necessarily need to follow all of the police officer’s orders. Be courteous and polite, but don’t be afraid to assert yourself and refuse to answer certain questions. Make sure the officer had proper cause to pull you over, and remember your Fifth Amendment rights! Don’t say anything that will incriminate you. Don’t even discuss how much you’ve been drinking that night. Refuse the breath test, and instead opt for a blood test. You will be taken to jail, but this will give your body time to remove the liquor. If you can post bail, you’ll be released, but the consequences won’t be over yet. Your license will be suspended within seven days of your arrest. You’ll also have to appear in court twice: once for a DMV hearing, and again for your criminal court case. Beyond acting responsibly and keeping your court dates, you may need a DUI lawyer. If you need to keep the DUI off your record, or you need help with your DMV hearing, you should hire a DUI attorney. If you want to contest your license suspension, you’ll only have seven days to do it, according to FindLaw. You must request a separate hearing where you will present your case to an administrative judge. Meanwhile, for your criminal proceedings, you’ll need help determining how to plead for the charges against you. You may need to make a plea bargain, which is pretty common. A DUI attorney can guide you along this path. If you need professional expertise, CEGA CRIMINAL LAW, Inc. can help. Let us represent you as your DUI lawyer and we’ll be with you every step of the way.